Opened in November, 1950 in the restored earth-walled building of an approximately 200-year-old rice granary. The display area was doubled in 1957 with the addition of an expansion, also in keeping with the rice granary design. 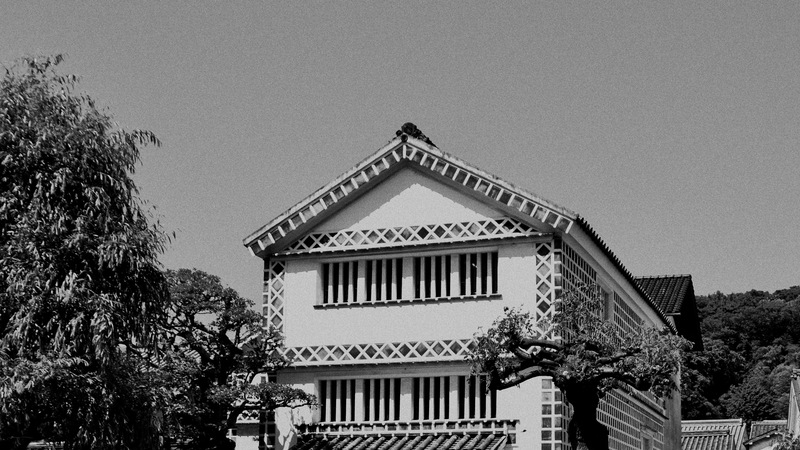 In the Edo period Kurashiki was under the direct control of the Shogunate. It was a gathering point for goods from the surrounding areas. The Kurashiki River, which runs in front of the Archaeological Museum, was long ago a canal connecting the Kojima Bay with the Seto Inland Sea. In the Edo period, storehouses and large merchant homes were built on the banks of the river, and boats plied the river laden with various goods. The Archaeological Museum is one of those storehouses. ...are items of archaeological interest found in areas of Okayama facing the Seto Inland Sea, including Kurashiki. They date from the Paleolithic age (30,000 - 15,000 B.C.) through the Jomon, Yayoi and Kofun Periods (7th Century) and from the Nara Period (8th Century) through to the Muromachi Period (16th Century). It is known from the wealth of artifacts and historical sites remaining in the area, that Okayama prefecture and areas in the eastern half of Hiroshima prefecture, long ago known as “Kibi”, flourished with a rich and thriving culture. The stone, bone, earthenware, copper and iron items found among these artifacts number over 700 and are on permanent display. The items central to the exhibit are those gathered and researched by this Museum. 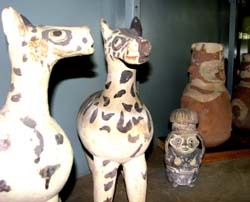 In addition, there are also items gathered long ago, items entrusted to the museum, and ancient Peruvian earthenware (pre Inca). 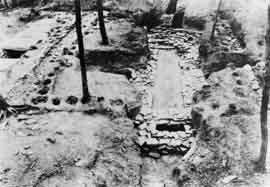 The Jomon period which continued for several thousand years, left a particularly large number of shell mounds in a tract of land facing the Seto Inland Sea. 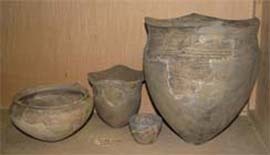 There are many pieces amongst this museum’s collection which are representative of the Jomon period earthenware of this area, excavated from sites such as the Satogi, Suzumamimatu, Nakatsu, and Fukuda shell mounds. Also, as the Yayoi period gave way to the Kofun period, the area already had a degree of political and cultural independence from the Nara/Osaka area. 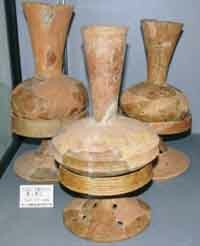 Decorated large-sized special stands, pots and house-shaped stands of shapes and designs for which no other examples have been found, have been excavated from tombs of around this time. These are also on display. There are numerous large tumulus mounds here which are second to none, even in comparison to the enormous tumulus mounds built as imperial mausoleums in Yamato (Nara) and Kawachi (Osaka) in the 5th century A.D., when especially large tumuli were built. Clay pumas and human figures. the last stage Yayoi Period. With strong naval power in the central Setouchi Area, the ruling family likely had relationships with powers both to the east and west. Above the square front of Tsukuriyama Tumulus Mound is a stone coffin made from stone materials from Kyushu and in the Senzoku Tumulus Mound, built directly in front of Tsukuriyama Tumulus Mound, is an inner chamber with a stone screen carved with straight and circular lines identical to the decorated tumulus mound in Kyushu. Since around the Kofun Period, the Kibi area has received a lot of attention as a place that yields a lot of salt and iron. It is thought that these are what supported the power base in Kibi. Not only weapons, but also farming, industrial and fishing tools of various kinds have been found in the 165 meter long Kanakurayama Tumulus Mound in Okayama City. These are also on display. 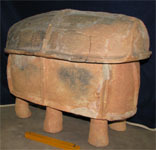 Characteristic of the Kibi Area from the latter half of the 6th Century to the 7th Century, is the distribution of multi-legged clay coffins centered mainly in the Kibi Area, and the spreading use of cremation from the beginning of the 8th century. 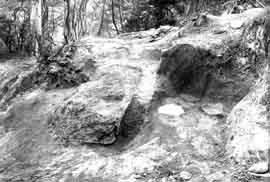 It could also be said that the success of local-born Kibinomakibi was also because of the heights of power and culture reached here since the Kofun period. 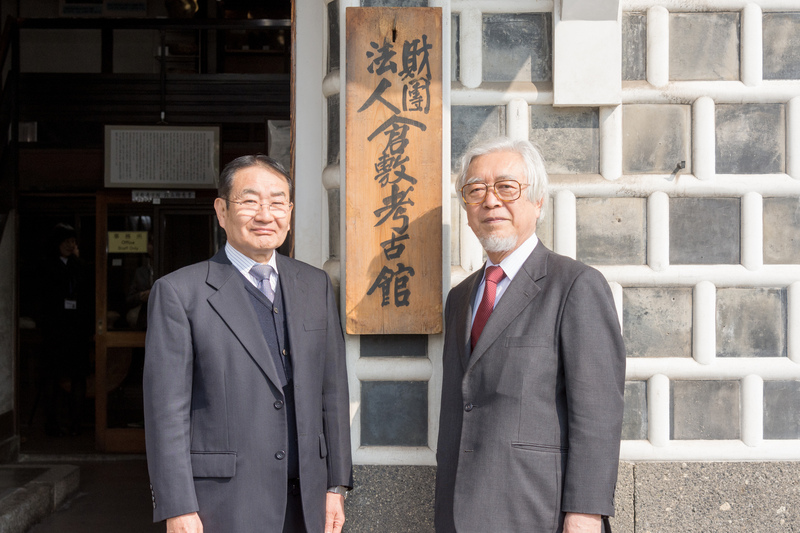 Kibinomakibi become one of the top two ministers in the country, a very rare achievement for any local person since the Nara period. Clay tablets excavated from land which could also be called the birthplace of Kibinomakibi, are also on display. These tablets are engraved with the characters 買地券(baichiken), with its origins in Chinese Taoism. Because Taoism had otherwise not spread in Japan, we can see that the Kibi area at this time was already developing and capable of contact with Chinese culture. ...are focused mainly on the culture of Kibi, including not only the display and description of excavated items from archaeological sites, but also, in order to more deeply understand ancient Kibi, a great deal of research. 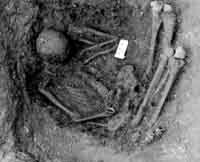 This research includes, but is not limited to, research of the archaeological sites already mentioned, the results of which we present to the public. These include the publications "Kanakurayama Kofun" and "Memoirs of the Kurashiki Archaeological Museum nos 12-21." 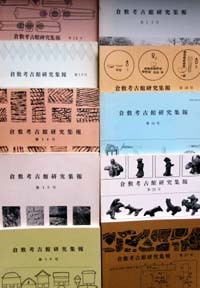 The contents of these publications cover the Washuzan archaeological site, Satogi Shell Mound, Tsushima site, Imokayama site, Myotoiwa site, the Kuromiya Tumulus Mound, and Hiroe-hama site etc, with research topics including: pottery used for making salt, stone coffins, footed pots with sculptured ornaments, clay coffins, cremation urns, Buddhist sutra engraved on tiles, and Bizen pottery. These also make up the majority of the items on display in the museum. Clay pumas and human figures. Ancient Peru, Chancay culture. 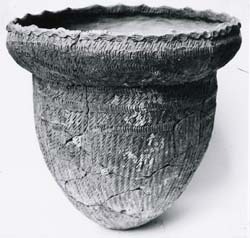 Middle Jomone Period pottery, Suzumimatｓu shell midden. 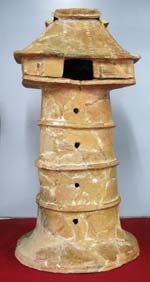 Clay house-shaped stand from the last stage Yayoi Period. Myuotoiwa site. 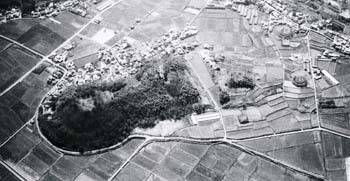 In the group Tukuriyama Tumulus Mound, Senzoku, Sakakiyama, etc. 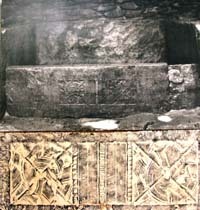 Kyushus-style stone chamber of Senzoku Tumulus Mound, this chamber with decorated straight and circular lines. 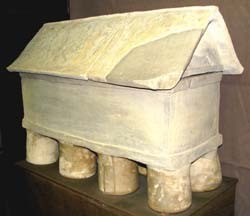 Funerary urn and small house shaped clay coffin. Copyright © Kurashiki Archaeological Museum. All rights reserved.